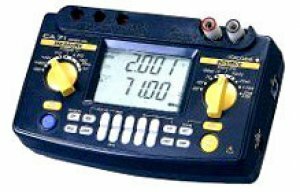 The Handy Calibrator incorporates rotary switches for simple handling. Just open the carrying case cover and connect the cables, and you're ready to take measurements. Output settings are divided, eliminating the need for bothersome calculations for percentage output. Changes the output value in step form based on the setting from the divided output (n/m) function. Changes can be sourced automatically every 10% or 25%. Linearly increases or decrease the output. The increasing/decreasing time can be set to either 16 or 32 seconds. Source values and measurements forming individual value sets can be saved to or read from the Handy Calibrator's internal memory (maximum 50 value sets). CA71/SP1 includes Communications cable, data logging softare, 120V power supply, magnetic backing instrument case, source/measure cables, NIST traceable certification. Yokogawa Meters & Instruments assumes no liability to any party for any loss or damage, direct or indirect, caused by the use of the product, or any unpredictable defect of the product. Modification of the product is strictly prohibited. Reverse engineering such as the disassembly or decompilation of software is strictly prohibited. No portion of the product supplied by Yokogawa Meters & Instruments may be transferred, exchanged, leased or sublet for use by any third party without the prior permission of Yokogawa Meters & Instruments. The communication function of CA71 Communication Software enables users to set output values of the CA71 on a PC. However, the range for generation/measurement should be selected using the rotary switch on the calibrator. Dec, 2010 1.10a Trouble in which installation fails with OS other than English was corrected. Click links of "CA71Software_E_V110b.zip" to download the compressed file. Unzip it and install software according to install manual.